Summit Elevation: 3303′; Base Elevation: 1250′; Vertical: 1100′. 4 Lifts: 1 triple, 1 double, 1 j-bar, 1 platter pull. Uphill Capacity: 3,700/hr. Terrain Mix: 33-34-33; 143 skiable acres. Longest Run: 8,000′. Season: usually mid December through April. Annual Snowfall: 120″. Snowmaking: 98%, although 60% is generally the limit of the annual snowmaking; the rest of the trails rely on natural snow. Please note that this site is not affiliated with Black Mountain Ski Area; we just happen to be its biggest fans. If you are looking for the official Black Mountain website, please click here. Otherwise, continue reading: lots of photos and information below. 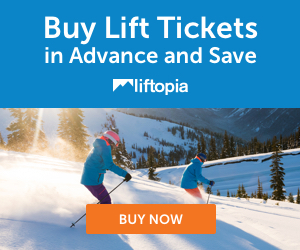 Note also that if you are looking for discount lift tickets, they are often available through our Liftopia link. If you have a specific day planned, this will often enable you to save a few dollars. The Platter-Pull Surface Lift is a rite of passage at Black Mountain; virtually every kid under the age of ten has fallen on this lift at least once. The trick is to send your child without poles until they are accustomed to the lift. It’s also important to have them stay in the track as much as possible. The Summit Double Chair is a Meuller fixed-grip double with Riblet Chairs, painted red. The ride is smooth as silk, and because the summit terrain is somewhat tougher than the lower mountain, it is seldom slowed or stopped for novices with loading troubles. Midstation is certainly an option; be advised that it’s a fairly steep ramp that can give pause to some novices. There is usually no line at the Summit Double; even during peak holiday periods it only backs up 4 or 5 skiers at most. The East Bowl Triple Chair is a fixed-grip Borvig Triple. Although it is primarily used to access East Side trails, it can be used to reach every trail below summit, simply by traversing left as you unload. The Triple receives more traffic than the Double, if only because of its location and the fact that it services generally easier terrain. Because of the volume of beginners and little tykes using the Triple, it is more prone to slowing and stopping. During holiday periods, it’s unusual to ride the Triple without a pause, but these are never prolonged and a small price to pay for such a pleasant ride. Like the Double, it has no liftlines to speak of, although it sometimes appears that way as crowds tend to gather at the lift entrance, which are the result of families and friends regrouping after a run. Lines seldom extend more than 5 or 6 skiers, even during holidays. Although we must note that if you happen upon Black during a holiday week, with lots of snow, and blue skies, you will find lines at the triple. 5-8 minutes at most. Note with the Triple that you may not want to send one or two young children alone on this lift. While it is perfectly safe, some of the bars and footrests are a sort of shop welded metal construction that may be too heavy for grade school children to raise and lower properly. The J-Bar is an older lift located behind Whitney’s, in the base area beyond the Summit Double. It is based on the original “shovel handle tow” located at Black Mt., and is easily one of the nicest, smoothest and most comfortable surface lifts you’ll ever ride. This lift generally operates only on holidays and for special ski history events. � Down Under, runs along the black East Bowl Triple liftline. � Lo Road, shown as a yellow and red line next to East Bowl. � Little Dipper, shown as a red line off Big Dipper. � Quick Way, shown as a yellow and red line connecting Lower Speedwell to Big Dipper. � Raceway, which is shown as an extension of the S-Turns trail. Trails and chutes that may be visible but are not depicted due to space limitations include Bat Cave, Zip, Sweet, Dew Drop, Down & Out, Breezeway, Black Diamond, No Turning Back, and others. Bat Cave East Side Not so much a trail as a connector between Jackson Standard and Runaway. Not usually groomed. Big Dipper West Side A true favorite at Black. Drops off Valley View. Narrow and challenging, with one very short but steeeep section. It is usually always groomed and can be handled by most high-end intermediates when it is. Novices and lower intermediates should not use this trail. Looking down at a skier just about to disappear over the “big dip” in Big Dipper. Photo taken on a day with plenty of snow; even though the trail had been groomed it skied as if ungroomed. Black Beauty East Side Marquee novice route off the triple chair. Meanders through the woods, width and pitch varies. Quite a pleasure for novice skiers. Continues as Lower Black Beauty. Snowmaking. It is usually always groomed. entering Black Beauty at the end of another fantastic day at Black Mountain…notice the smile! Black Forest East Side Short tree skiing section connects Black Beauty to Sweet Dreams. Trees are a bit tight, but the pitch is not steep. Sort of an interesting boulder in the middle of it. Never groomed, but seldom open. Beauty Loop East Side Brief segment off Black Beauty that connects to Sugarbush or dumps back into Black Beauty, whichever the skier chooses. Easy pleasurable cruise. It is usually always groomed. Black Diamond West Side Like Maple Glades just above it, this is a natural barrier of trees and rocks between the lower portion of Maple Slalom and Roller Coaster. Consists of one large boulder, a bunch of trees, and a pile of rocks. When the snow dumps, you can ski it. Kind of. Bob-A-Link West Side West Side’s long winding road, accessed from Upper Speedwell or Valley View, and serves as the runout for Lower Speedwell. Although it has some tight turns, can easily be managed by all but the lowest level novice. Has an old-fashioned uphill section just above the top of the Platter Pull; this is the sort of thing most ski areas bulldoze and is one of the reasons we love Black Mt. Bob-A-Link is usually groomed. Breezeway East Side/ under Triple Connector between Upper Jackson Standard to Down Under. If you work at it, you can manage to cross clear over to Valley View, although it doesn’t appear that way on the trail map. This is another of those famous Black Mt. quick ways that would be roped off almost anywhere else. Short, narrow, flat, ungroomed. Carter Notch Glades Summit Cliff and trees on the right hand side of Upper Maple Slalom, after the first pitch. Just plain nasty. If you have friends who dismiss Black as an “intermediate mountain,” do me a favor and point them into Carter Notch Glades. Chute East Side This is the trail immediately off the triple chair, parallels the chair down to Drop Off/Jackson Standard. Although it is frequently groomed it is narrow, often icy and shouldn’t usually be attempted by low level intermediates. Davis West Side Easy rolling cruiser that collects West Side traffic from Big Dipper and a few others. Used to move from West Side/Platter Pull to Triple. Usually groomed. Looking up at the beginning of Davis on a powder day. Big Dipper drops in at the upper right of this photo. Dew Drop East Side Just a connector between Upper Jackson Standard and Galloping Goose. Although quite narrow, it can easily be negotiated by all but the greenest novice. But because it leads only to intermediate trails, it is rated intermediate. Down & Out East Side/ Under Triple Just a connector that leads from Down Under to Upper Jackson Standard. So narrow, you’ll hardly believe it’s a trail. Ungroomed. Down Under Under Triple Wildly varying route that runs almost the length of the triple chair liftline. Some parts are flat, some narrow, some bordered by stone fencing…all of it ungroomed and relying on natural snow. A very tough run; most people pick and choose sections of it. The easiest way to get a taste for it is to skip the steep pitch by moving onto Jackson Standard, then jump back in for the gentle runout, which is a pleasant cruise through the trees. Drop Off East Side Just a connector, really; this is the section that leads from East Bowl/Galloping Goose over to Upper Jackson Standard and on toward the West Side, and I suppose it refers to the various drops in and around Chute. The main thorofare is usually groomed and easy to negotiate, a traverse more than anything else, but because it leads only to intermediate trails, it is rated intermediate. East Bowl East Side Large, open area off the top of the triple. Skier’s right hand side of the bowl is somewhat steep; novices should keep to skier’s left. Pleasant route that serves the East Side of the mountain. Among the first areas to receive snowmaking. It is usually always groomed. Galloping Goose East Side Rolling intermediate cruiser, sister trail to Juniper, perhaps slightly narrower. Can be negotiated by all but the greenest novice. Often the first upper mountain trail to receive snowmaking. Connects to Goose Pitch, although novices who don’t want to deal with the pitch can make a quick left and drop in on Lower Black Beauty. Galloping Goose is usually always groomed. Goose Pitch East Side Rolling intermediate cruiser, collects traffic from Juniper and Galloping Goose, and feeds them into a “pitch” that gives most novices pause. Then goes on to collect traffic from Runaway, feeds into Raceway or Lower Black Beauty. Other than the pitch, this would be easy pickings for novices. Opens early in the season, and is usually always groomed. View down Goose Pitch from the end of Galloping Goose. The trail seems to disappear; that’s the “pitch.” Attitash is visible in the distance. Hi Road East Side Easy traverse parallels the transition from East Bowl to Sugarbush. Not sure why it is rated intermediate. Jubilee Platter Pull Wide novice area at skier’s right off Platter Pull. Final pitch can be intimidating to many novices, and requires specific instruction lest the beginner schuss straight into the parking lot. Always groomed. Juniper East Side Rolling intermediate cruiser, sister trail to Galloping Goose, fewer turns than Goose but more dips. Can be negotiated by all but the greenest novice. One of the first trails above the platter pull to receive snowmaking. It is usually always groomed. Last Chance West Side Seldom used quasi-traverse through the woods atop Mr. Rew. Sort of connects Roller Coaster to Big Dipper. Never groomed. Little Dipper West Side Very narrow connector from Big Dipper to Lower Speedwell. Rarely used, never groomed. Lo Road East Side Short but somewhat steep drop immediately off the triple, sort of a difficult alternate to East Bowl. Seldom groomed, often bumped up, not a trail for average intermediates. Lostbo Summit Short but very nasty steep trail drops like an elevator off the summit. Natural snow only, never groomed, experts only. Lostbo Glade Summit Sort of a continuation of Lostbo, not as steep but with the added joy of trees and rocks. Nastiest route off the summit. Natural snow only, never groomed, experts only. Lower Black Beauty East Side Continuation of Black Beauty. A little tougher than Black Beauty, has one mild drop that gives novices pause, as well as the mildly pitched bowl that drops to the triple and the lodge. Snowmaking. It is usually always groomed. The bowl dropping to the lodge can bump up on snowy days, but this is rare, and the timid can simply keep moving to skier’s left (toward the horse corral) for the easiest route. Lower Jackson Standard Triple Chair Runout of Upper Jackson Standard, alongside triple. Jackson Standard is generally the 7th or 8th trail to receive snowmaking. It is usually always groomed. Lower Speedwell West Side Wider, easier version of Upper Speedwell found below Valley View. Only way to access Quick Way. Usually groomed. Maple Glades West Side At first glance this appears to be a natural barrier of trees and rocks between the upper portion of Maple Slalom and Roller Coaster. It looks that way, because that’s what it is. But you’re certainly welcome to ski it…ungroomed, natural snow, experts only. Maple Slalom West Side/ Under Triple Rougher, tougher version of — and adjacent to — Upper Jackson Standard. Although only moderately steep, it relies solely on natural snow and is usually always ungroomed: Novices and intermediates should not use this trail. When Black Mountain personnel talk about “classic” skiing, this is what they’re referring to. Maple Slalom Chute West Side A lot of Black fans consider this a summit trail, but it can be accessed from the triple (or midstation on the double) if you’re willing to traverse. Can be skied by all but the weakest intermediates. Usually groomed. Looking down at the end of Maple Slalom Chute from the double. Mr. Rew West Side Rew is like Upper Galloping Goose; it appears to be a couple of cliffs but is actually a narrow trail that switchbacks down. Nasty just the same. Seldom open, never groomed. Mr. Rew Glades West Side Tree skiing area off of Davis. Situated such that it is inconvenient from Davis, therefore it is seldom used, other than by skiers off of Mr. Rew above. Ninow Platter Pull Easy rolling cruiser at skier’s left off Platter Pull, dumps into Davis. Ninow is a bit narrow at the top, so a lot of beginners are better off on Jubilee until they have confidence in their turns. Usually groomed. a view of Ninow from the Double Chair. No Turning Back West Side Not sure of this route, I’ve never seen it open. Appears to be a bailout from Mr. Rew to Roller Coaster. Out Back West Side/ Under Triple This is the runout trail for Roller Coaster and Maple Slalom. Despite what the trailmap shows, it cannot really be accessed from Davis unless there’s a ton of natural snow. A pleasant, flat trail but seldom groomed. Playgrounds Platter Pull Terrain park at skier’s right off Platter Pull, uses a section of Jubilee. Let’s hope this is the limit of the terrain park nonsense at Black Mountain. Quick Way West Side Flat little road off skier’s left near bottom of Lower Speedwell. Can be hard to spot, requires a slow descent on LS to make the turn. On powder days this can be untracked as a result; it’s a fun blast through the snow when it is. Look uphill when you ski this; potential for collision with traffic from Big Dipper. Sometimes groomed. Rabbit Run East Side Very short tree skiing section along the end of Sugarbush. Although relatively flat, some intermediates will have fits in Rabbit Run. Never groomed. Raceway East Side Part of the big open area just above the triple chair on the East Side, and arguably the most enjoyable route through the meadow. Can be negotiated by all but the greenest novice. Often the first upper mountain trail to receive snowmaking. It is usually always groomed, although it frequently has some ungroomed areas on the sides. Roller Coaster West Side/ Under Double Runs from Valley View under double, next to Maple Slalom but not as steep. Natural snow, never groomed, experts should be confident in their ability off the courderoy before attempting this one. Truly old-fashioned New England skiing. Runaway East Side Rolling intermediate cruiser, offers a “bail out” just prior to the moderate drop on Jackson Standard. Although shorter, it’s similar in style to Galloping Goose. Can be negotiated by all but the greenest novice. For some reason, people have trouble finding this trail. It is usually always groomed, although I’ve seen the short section after S-Turns left untouched. here’s the entrance to Runaway, looking down from the left side of Upper Jackson Standard. S-Turns East Side Short, narrow, switchback type trail that snakes off of Runaway. Natural snow, ungroomed, frequently icy. Even so, a good intermediate can handle this with no real trouble. Spruce East Side Short trail between Juniper and Black Beauty, has little crossovers to both trails. Quaint cruise that splits around a small stand of trees. Easy novice trail, generally 3rd among East Side Trails to be opened. It is usually always groomed. Looking down Spruce just past the entry point. Sugar Glades East Side Tree skiing section at the end of White Knuckle. Really for more advanced skiers, unless you can find the wide path in the middle of the glade. Never groomed. Sugar Loop East Side Short, interesting loop off Sugarbush, where Sugarbush turns “down” the mountain. Easy section, provides access to Sugar Glades. It is usually always groomed. East Side This is the “long easy way down” on the East Side. Unfortunately for really green novices, it’s generally among the last of the East Side trails to open. Fairly narrow, it winds around and is one of the reasons young families fall in love with Black Mt. It is usually always groomed. Sun Valley West Side/ Under Double Oft-avoided connection from Maple Slalom Chute to Valley View, directly under double. Short and moderately steep, it receives snowmaking but is usually ungroomed; novices may have fits with this one. Novices looking to try their chops on the West Side should skip this and wrap back under the double chair on Valley View. Sweet East Side Short little chute between Black Beauty and Sugarbush. Usually takes skiers by surprise; a very pleasant little diversion. Sweet Dreams East Side Narrow, old-fashioned trail that offers an alternative to Sugarbush. This is one of those under-used trails that allows you to continuously mix it up at Black; one of the reasons the mountain is never boring. Very narrow; easy except when it is icy. It is usually always groomed. T2 West Side Short but very nasty cliff complete with rock drops and trees. Easiest route (ha!) is to stay to skier’s left and sort of loop down around the rock face. Natural snow only, never groomed, should only be attempted by expert or extreme skiers. Upper Black Beauty Summit to East Side Easiest route off the summit, wraps under the summit double chair then traverses skier’s left across the summit, then elbows right where it empties into Sugarbush or Black Beauty. Sometimes icy at the elbow, but even at its worst can be handled by any upper level novice. Generally always groomed. looking back up from the “elbow” on Upper Black Beauty. Photo was taken on one of the rare days this trail wasn’t groomed, following a major snowstorm in February 2007. Upper Jackson Standard East Side Showcase trail, runs alongside the triple. Although it has one reasonably steep section, a lot of novices find their way onto this trail with Mom or Dad, which means that you can sometimes be surprised by tykes snowplowing right in the middle of it when you drop in. Jackson Standard is generally the 7th or 8th trail to receive snowmaking. It is usually always groomed and can be handled by most intermediates when it is. above, looking down at a skier approaching the headwall. below, looking at the headwall from the triple chair. Upper Galloping Goose Summit/ Under Double You have to actually ride over this trail to understand it; from below it just looks like a series of cliffs. The trail in fact switchbacks down through the cliffs, and never gets horribly steep. But it is narrow, natural snow only, never groomed, experts only. Conditions usually require jump turns. If you aren’t confident in your jump turns, don’t attempt this. Upper Maple Slalom Summit Moderately steep, narrow, sometimes bumps up. This is the route to skier’s right, off the summit. The second pitch is the hard one. Can generally be handled by upper level intermediates, but they won’t necessarily enjoy it. Skier can turn right to reach West Side via Maple Slalom Chute, or proceed straight to East Bowl area. Grooming depends on the season…when groomed, it’s fine for upper level intermediates. When it isn’t groomed, it’s for advanced skiers only. Upper Speedwell West Side Very narrow, rolling cruiser offers a couple of exciting jumps. Only negative is a somewhat blind intersection with Valley View. Can be handled by most intermediates. Usually groomed. Valley View West Side In conjunction with Bob-A-Link, this is the easy way down the West Side. Collects traffic that originates on East Side and traverses across mid-mountain, as well as skiers from Maple Slalom Chute. Wraps back under double, then has one narrow and often icy drop, but nothing too troublesome. Used to access Big Dipper or continue on to Bob-A-Link. Easy enough for all but the greenest novice. Caution is advised where VV bisect the Speedwells. Usually groomed. White Knuckle Summit to East Side Continue straight ahead at the elbow on Upper Black Beauty, and you’ll find yourself on this nasty trail. Narrow and wooded, never groomed, empties into Sugar Glades. Truly for experts only, seldom open. here’s the entry to White Knuckle at the “elbow” of Upper Black Beauty. I’ve looked down it…and passed. Zip East Side Just a connector between Galloping Goose and Upper Jackson Standard. Easily be negotiated by all but the greenest novice. But because it leads only to intermediate trails, it is rated intermediate. Two classic lifts: Looking up the double chair liftline as it crosses over the platter pull. Left-click the photo to download an 800 x 600 wallpaper, then right-click the large image to save or set as background. View from the summit of Black Mountain, after unloading from the double chair, looking northwest toward Pinkham Notch and the Presidential Range. Few base lodges provide an atmosphere as low-key and pleasant as this one. As the official line goes, leave your lycra at home. The food in the cafeteria is just fine; it’s the same food served in the Lostbo Pub but you can’t move from one to the other with your tray or platters or beer or whatever. If you want the fireplace, do the cafeteria. If you want a beer, do the pub. The pricing is the same, and is quite reasonable — you won’t cringe when you get the bill for a family meal. Be advised that the foodservice can be hit or miss as far as timing goes. Wait times may range from a few minutes to dreadfully and inexplicably long. But it’s Black Mountain, the pace is easy, the living is good. No complaints. Enjoying the entertainment in the Lostbo Pub. The fireplace and cafeteria are just over the half-wall. Whitney’s is an old-timey ski lodge located in the parking lot between the double chairlift and the j-bar. If you stay here and ski here, you’re experiencing New England skiing the way it was in the 1940s and 1950s. With new owners and revitalized decor, Whitney’s is simply terrific. They’ve also reopened the Shovel Handle Pub — Shovel Handles were attached to the overhead cable lift in the 1930s to make it easier to ride — this is in a hand-hewn timber barn with atmosphere that just won’t quit. It’s a tough choice because Lostbo Pub is right at the ski area, although our pick is to eat lunch at Lostbo and head to Whitney’s for an early dinner after the lifts close down. Add it all up: close parking, affordable tickets, friendly people, short or nonexistent liftlines, pleasurable skiing, variety of trails, relaxing apres-ski, Black Mountain can’t be beat. As writer and webmaster of SkiBum.net, I visit almost 20 different ski areas across the country each season, and am convinced that Black Mountain represents one of the best values in skiing today. I encourage all skiers enthusiasts to visit Black. Put it at the top of your “must-ski” list! Free Ski & Snowboard Stickers!